Cam's Cinematic Episodes: Cam Returns To The Hype! Cast! Hey there true believers, you can believe the rumors tantalizingly swirling around the watercooler! The impossible has happened. An event of biblical proportions which shall forever redefine the way we, as the human species, look upon this great spinning blue sphere we call home. 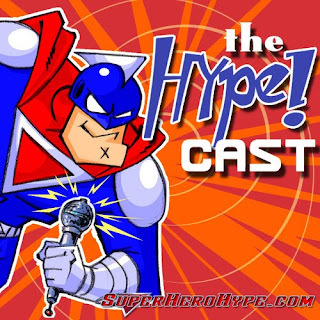 I was asked back to superherohype.com's illustrious Hype! Cast, hosted by the too-cool-for-school highscorefilms and the ever-humble "Champion Of The Universe" Immortal Fire! So, listen in as the two venerable hosts, along with special guest Drakon, and myself (blithering mindlessly under the anonymous cloak of my ever-reliable moniker Episode29) discuss all manner of things including G.I. Joe: The Rise of Cobra, X-Men Origins: Wolverine and Stan Lee's best cinematic cameos. It's fun of the highest, most godly, order. Download episode 29 (tee hee) to hear this episode, or you can check out my previous appearance reviewing Transformers 2 in episode 24. After that, go nuts and consume all the fellows' previous efforts. Fun for all, it is! Click here for the Hype! Cast feed! Click here for the Hype! Cast iTunes page! And, once again, the biggest of thanks to highscorefilms, Immortal Fire, Drakon and Malice (who unfortunately couldn't make the record) for humouring me.